Currently much in vogue with a number of our members is this intriguing set of rules from Peter Pig for conflicts before, during and after World War One. As the name suggests it divides the battlefield into a square grid to regulate movement leading some people to suggest it a cross between miniatures and board games. It also features a pre-battle system which creates a scenario to play including a number of "variations" for each side - bad and good. 10mm seems to be the scale of choice. This is a set of WWII rules that are easy to pick up, but like the best, have many subtle nuances making play great fun. They are designed to be for 20mm figures and can be played from battalion level upwards. Depending on your army and year; a battalion has from 30 to 50 figures. The rules work on an alternate movement system with factors for most eventualities. However, they are easy to adapt if you wish to play a specific scenario or campaign game. The basic rule set is supported by a number of supplements giving details of army compositions in the various theatres. The Rapid Fire website also has a large number of free PDF downloads with vehicle details, playing hints and clarifications. One set of Second World War rules getting plenty of play at present is Battlefront WWII. 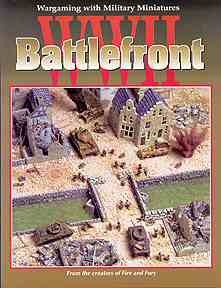 Battlefront WWII is a tactical level wargame of World War II ground combat using miniature soldiers and vehicles. The basic organization is the "maneuver element" which is usually a company sized formation of units which fight as a group. Each player takes command of one or more maneuver elements to refight either historical or hypothetical battles. 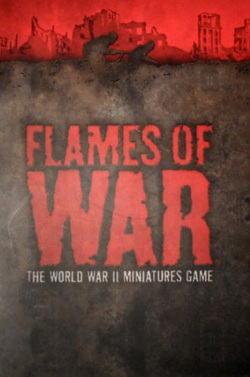 “Flames of War” rules cover the Second World War, with supplements for The Arab/Israeli Wars, and Vietnam. Unlike most other sets, it describes itself as a “game”, and not a wargame; and the writers make a determined effort to promote good sportsmanship and playing for enjoyment right at the beginning of the rules. It works on the basis of turns, rather than simultaneous movement. Compared with some modern sets, simplicity is the order of the day. There are rolls to hit; to save; and firepower rolls to see if the target manages to survive a penetrating hit. Warhammer players are likely to feel at home with the system. Call it a “diceathon” if you wish, but I find it is more fun than fussing over theoretical armour penetration charts and thickness of a target vehicle’s armour as a way of getting a result. The rules are designed for use with 15mm figures and vehicles, with a scale of 1:1. Figures are mounted on bases of varying size with 2-5 figures per base. Casualties are removed as complete bases. All major participants in the second world War are covered to a greater or lesser extent (although there are not, as yet, supplements to cover island hopping in the Pacific, and the CBI theatre). The rules give national characteristics to each army. For the most part, this involves re rolls to hit, save, move further or survive a morale test.